Many years ago, Decipher made a collectible card game based on Star Wars, and the main characters from the movies made up a major proportion of the chase rares, as you might expect. The initial release sold well, but a lot of fans were frustrated by the difficulty of finding Luke, Vader, Leia, Han, and others. So for the second set, they released more common versions of the main characters that were also a little less powerful, but gave fans a chance to play with their favorites in some form. War of the Spark‘s gimmick reminds me a little of that – while we probably need to accept that, for good or for ill, the most powerful planeswalkers will generally be rare or mythic, the card type is such a major part of modern Magic that they really need to be seen more often and played by more people. Cards like Tibalt are a great step in this direction, and I really hope we see more like them in the future. By that, I mean Tibalt personally and also things designed like him. I do wonder how global enchantments’ prospects will fare once you can get that style of effect on a planeswalker with a minor loyalty effect in addition. Tibalt also can’t be disenchanted the way Sulfuric Vortex can. As you might expect for an uncommon, he doesn’t have much in the way of self-protection, unless you count that they seem to be intending for you to use his devil tokens to block anything that attacks him and add a minor injury to the insult of his static ability. Of course, I’m not sure that always matters so much when you’re in red – not only can you just kill a lot of threats with your direct damage spells, but more importantly, he’s likely in the same deck as Goblin Chainwhirler and other cards that will put your opponent in a defensive mindset. Tibalt turns off a common sub-class that that defense will take, and as such he definitely has potential. It might have taken almost seven years, but Tibalt went from meme card to constructed potential – a comeback story almost worthy of Wrestlemania. It seems that in Magic as in wrestling, sometimes a good look and a good story will get you farther than good stats! The long-awaited set of planeswalkers, War of the Spark, has materialized, giving us our first uncommon planeswalkers. And a lot of them. So with the set nearing release at month’s end, I figured it would do to hit on some exemplars of what is going on in the set, starting with the return of everyone’s “favorite” devilish planeswalker in Tibalt. For the most part, these planeswalkers function as killable enchantments; every planeswalker in the set has a static ability that’s always on and, depending on rarity, one to three loyalty abilities. Uncommon planeswalkers only have minus abilities, but there is proliferate to help them keep ticking for longer. So, Tibalt. Three mana for the “opponents can’t gain life” clause is about the right rate of return, and it’s a subtly powerful effect; dedicated life gain is rare, but incidental life gain is far more of a thing, and this keeps them in check somewhat. His only loyalty ability spits out an explosive Devil that blows up when it dies, and he can spit out two of them without assistance. So that’s 3 mana for blocking their life gain, a pair of 1/1 bodies, and an explosive finale…not bad, and certainly more interesting than Tibalt’s last iteration. 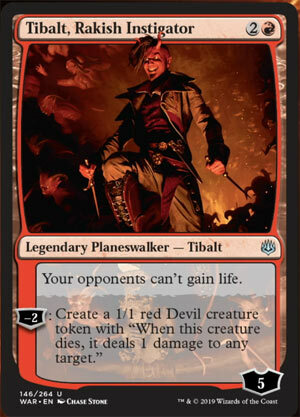 With the red deck still doing Things in Standard, Tibalt might have a role as a one-of or sideboard piece to keep their lifegain in check against green or white (or black) strategies. He’s not absurd, but I can see him doing enough in Standard to merit attention.